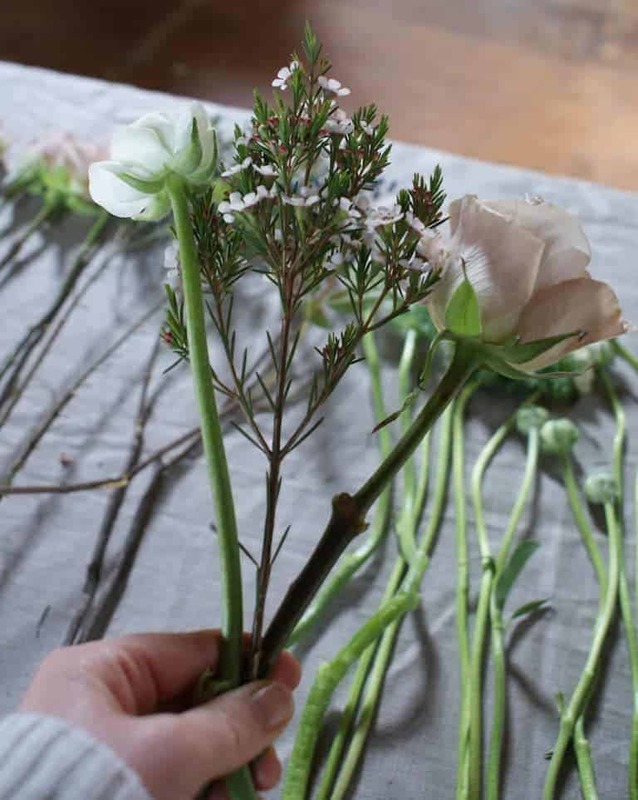 Join me as I learn how to make a hand tied flower bouquet using rustic spring flowers and seasonal foliage with Pod & Pip. For me, one of life’s great simple pleasures is arranging seasonal flowers and foliage. I can potter for hours, happily filling the house with jars, jugs and vintage containers arranged with whatever blooms and greenery I have to hand. What I’ve never actually made before is a proper hand-tied bouquet. You know the kind. 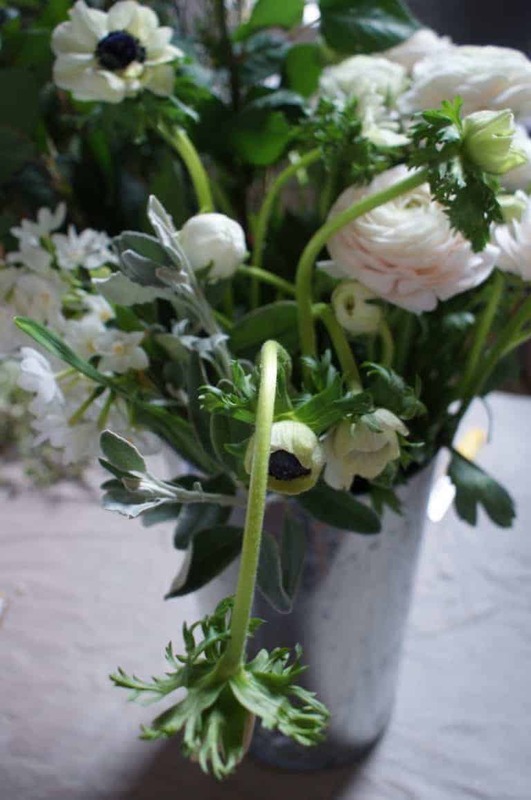 The flowers are arranged in a simple spiral, tied with string, ready to place into your vase. 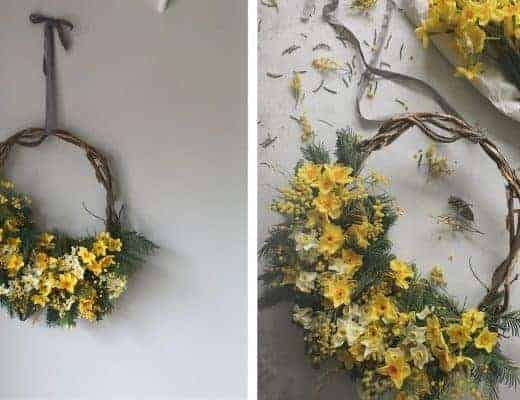 When Sarah Williamson-Jones owner of Pod & Pip invited me to join her spring flower workshop I didn’t need to think twice. 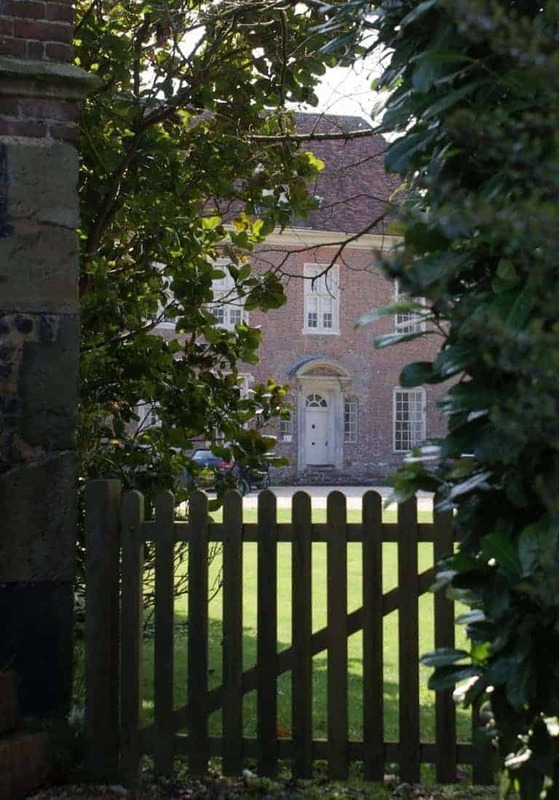 So, last Saturday morning I set off to rural Wiltshire with my camera, notebook and a light heart. The drive took me through the New Forest, still atmospheric with thick morning mist. Ponies were grazing beside the road, so progress was slow but magical. The sun was just beginning to break through as I drew up outside the picturesque barn in Odstock, near Salisbury. 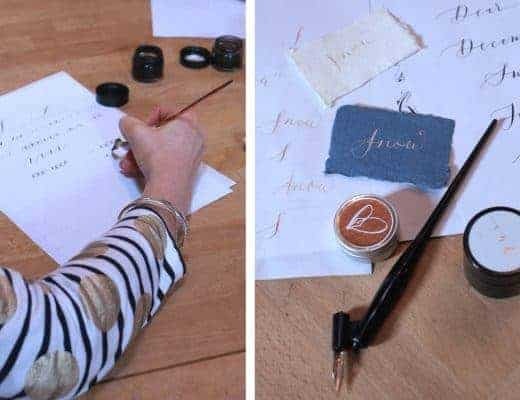 There were 8 of us on the workshop and we began by chatting over cups of tea and the most wonderful cakes handmade in Dorset by Alix Fauvel Cakesmith. 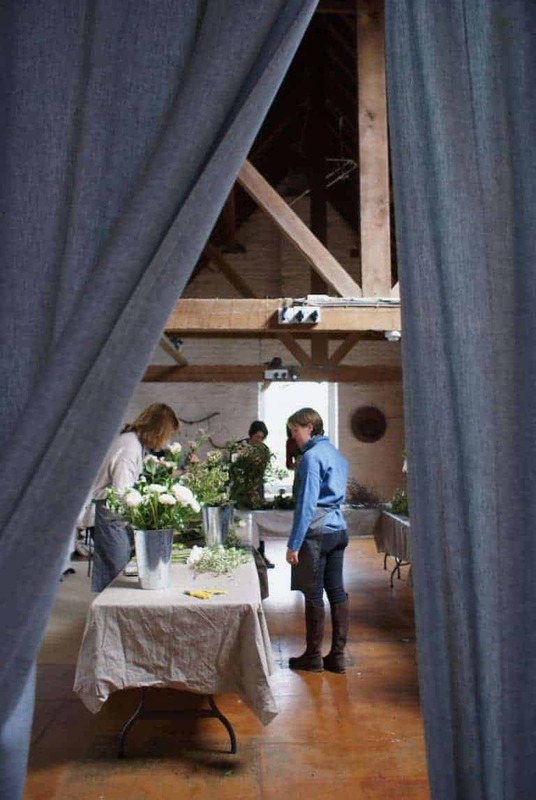 I’d glimpsed through the curtain into the studio where the most beautiful flowers were ready for us. I couldn’t wait to get started. 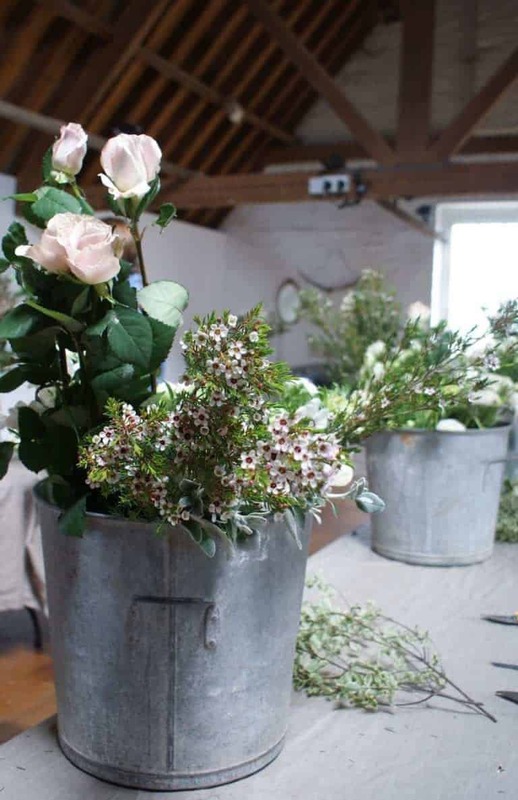 Sarah had given each of us a galvanised bucket full of the most exquisitely chosen blooms and foliage. 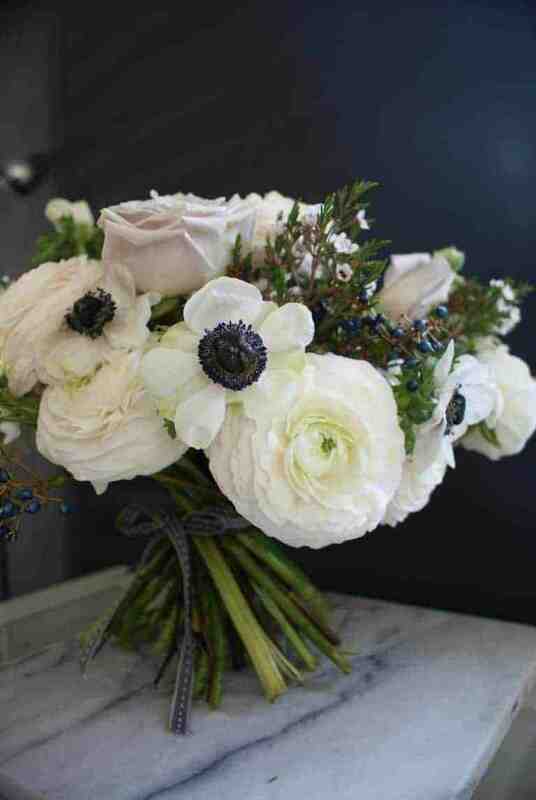 It’s all about the flower selection and Sarah has a fantastic eye for this. 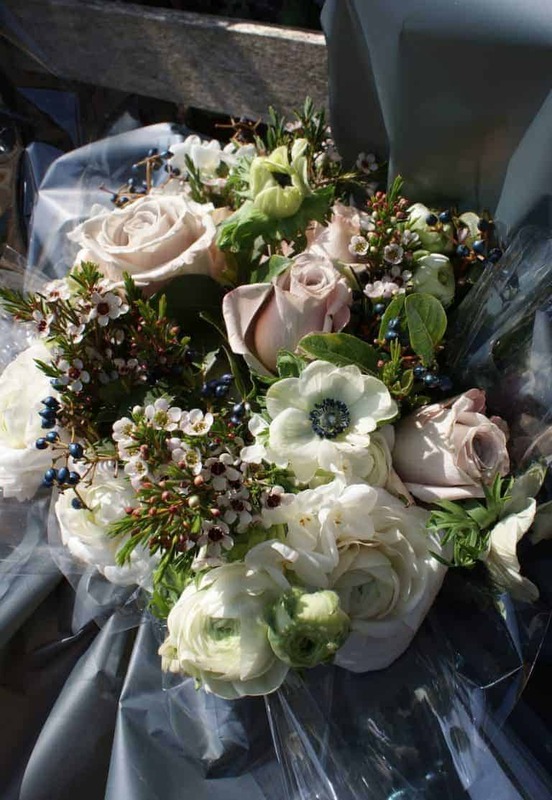 I adored her combination of Mentha blush roses, panda eye anemone, paper white narcissi, giant blush ranunculous Cloni Hanoi, bird berry and wax flower. 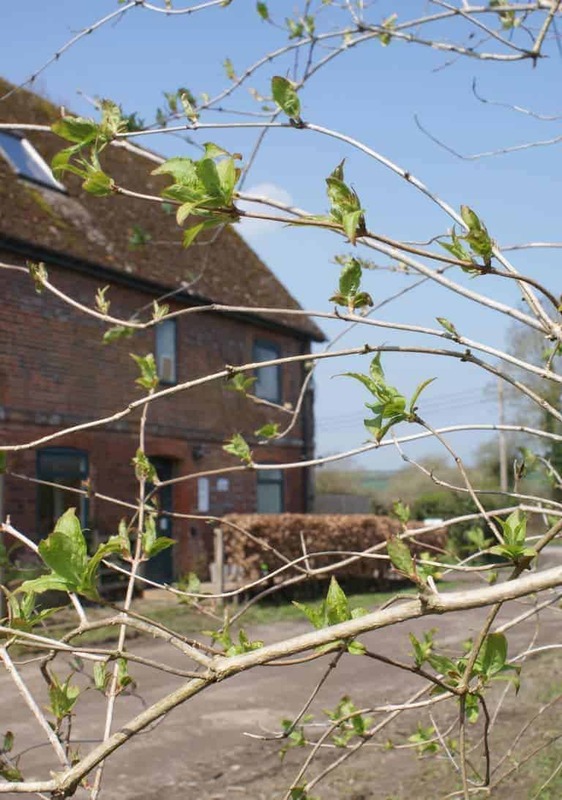 As well as a wide range of other twigs and foliage for us to pick from. 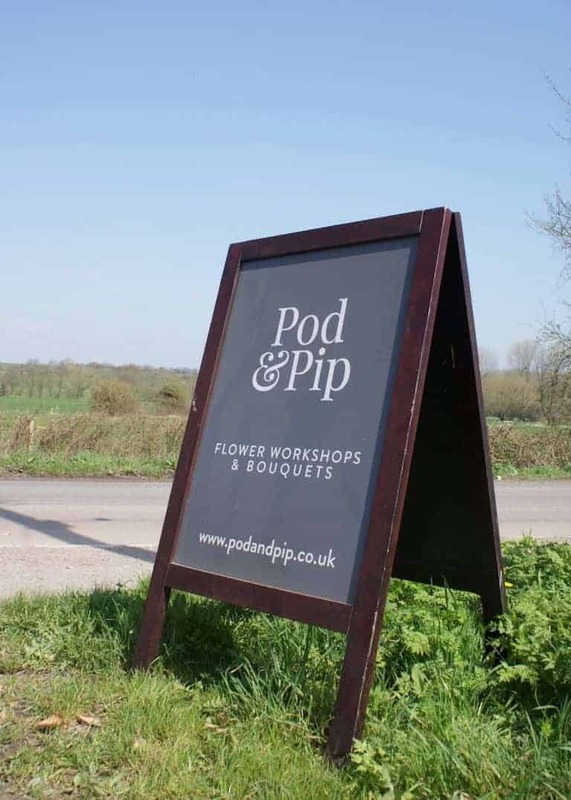 We moved through to our places and all put on our stylish grey Pod & Pip aprons. Sarah showed us first off how to prep our flowers. You have to be quite brutal at this stage. All shoots, leaves and thorns need to be removed, to make it easier to combine everything later. Sarah explained that this makes it much easier to spiral the flowers into the hand-tied bouquet. 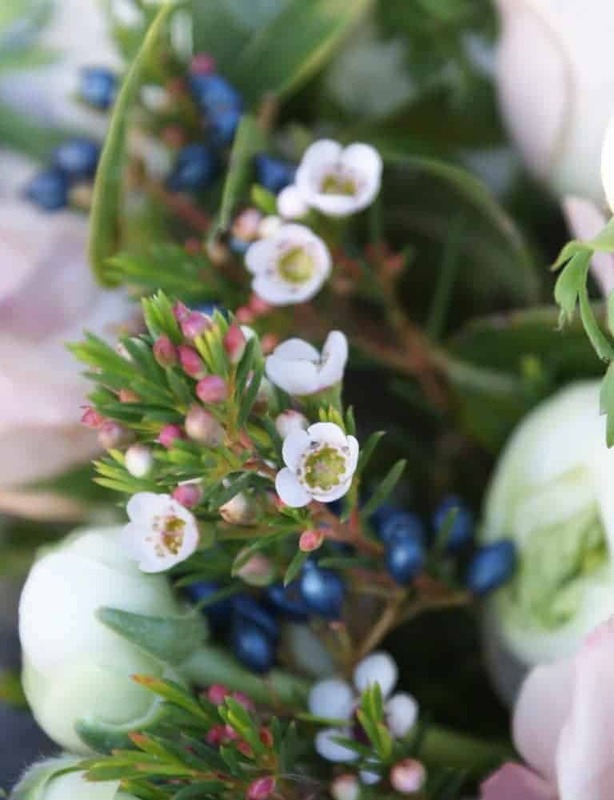 You don’t want unnecessary foliage or stems – just the top bits you’re going to actually see. This took a bit of time and I did have to battle with myself slightly about removing pretty smaller flower shoots. Sarah suggested keeping the offcuts for a smaller posy we could make later. That made it easier to slice and chop with abandon and soon I had all my flowers lined up, ordered into groups of the same flower. The key, Sarah showed us, is start with something strong and woody. 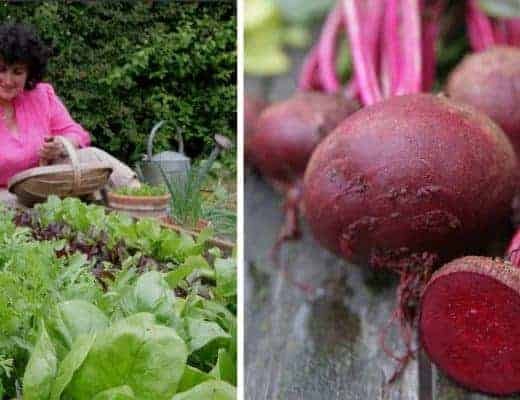 Like a sturdy rose stem, and then you add in, a piece of a time, holding it so the top and bottom are at 11 and 5 o’clock and then turning slightly before doing the same again. If you’re left handed, you’d place them at 1 and 7 o’clock. 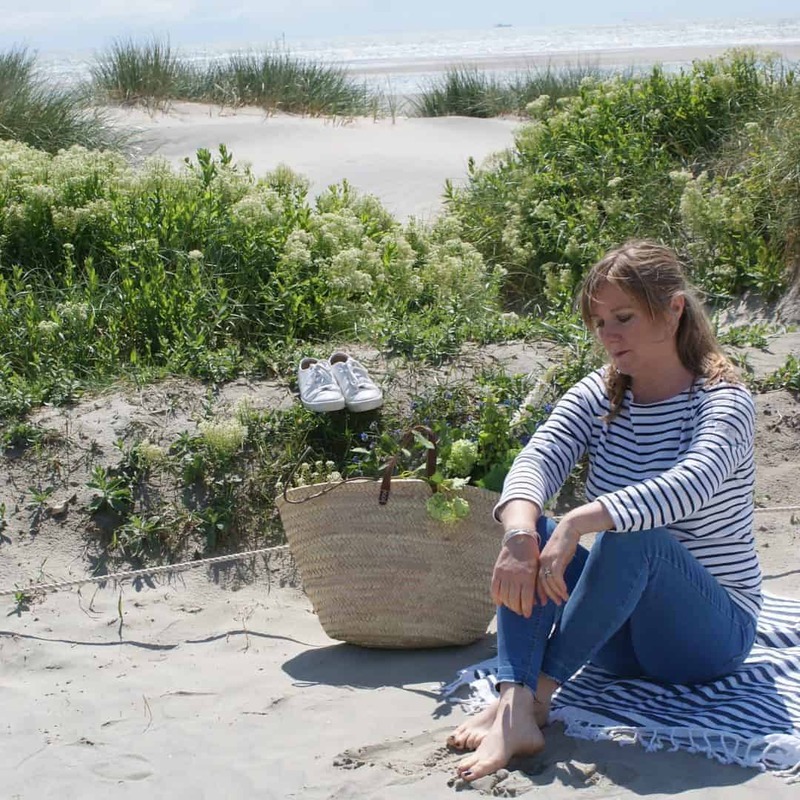 Sarah’s tip is to think about pointing the stem of your latest addition to your right foot (or left foot if you’re left handed). I found it harder than I thought to grip onto everything and hold in place whilst also thinking about what to add next. I got towards the end and decided I didn’t really like how it was looking. Too many flowers of the same type were sitting together in clumps and it was all a bit too tightly bunched. I think I was gripping too tightly and focussing too much on the spiral and not enough about the flowers. Don’t be afraid to put down and start again if you’re not happy, Sarah told us. So I did just that. It was a bit of a job untangling some of the more tender and wiggly stems, but I was glad I did. This time I held it slightly more loosely, a little further down the stems, and made sure I added the different types of flowers quite evenly as I went. I loved how the flowers, berries and foliage all worked together. 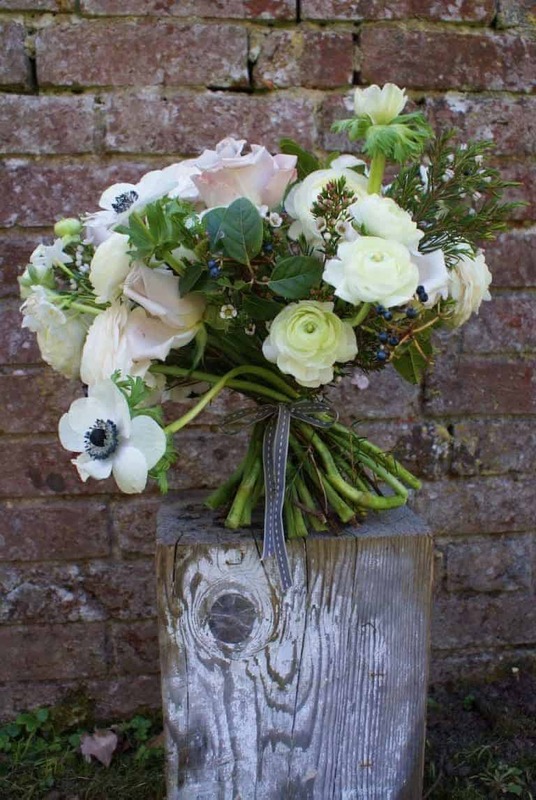 This is a rustic style bouquet anyway, so we’re not looking for perfection here. That’s always my challenge if I’m honest! I love rustic. 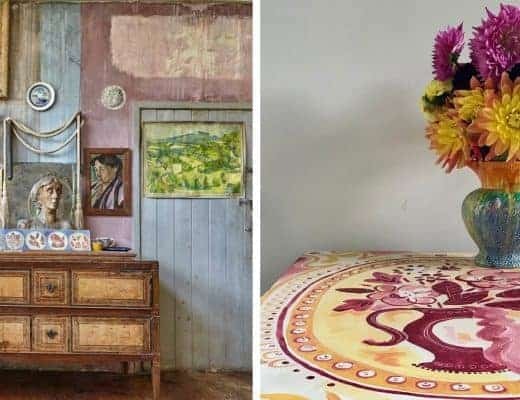 I love things that are well-worn and imperfect. I just struggle to create like that myself. I have a natural tendency towards symmetry and always want everything I make to be the best it possibly can be. 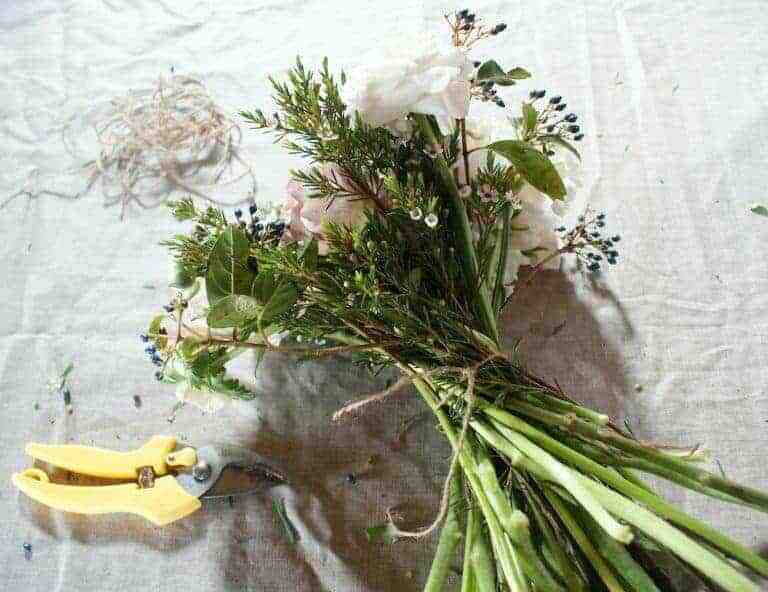 Once you’re happy, you tie the stems together firmly with string. At this point you can do any tweaking you want to do. I was pretty happy with how it was, I just wanted to move one of the roses over and give a little more space to the narcissi. To reposition the rose, Sarah showed me how to put it back in where I wanted it, making sure to follow the angle of the other stems around it. Tweaking done, it’s time to cut the stems to size. 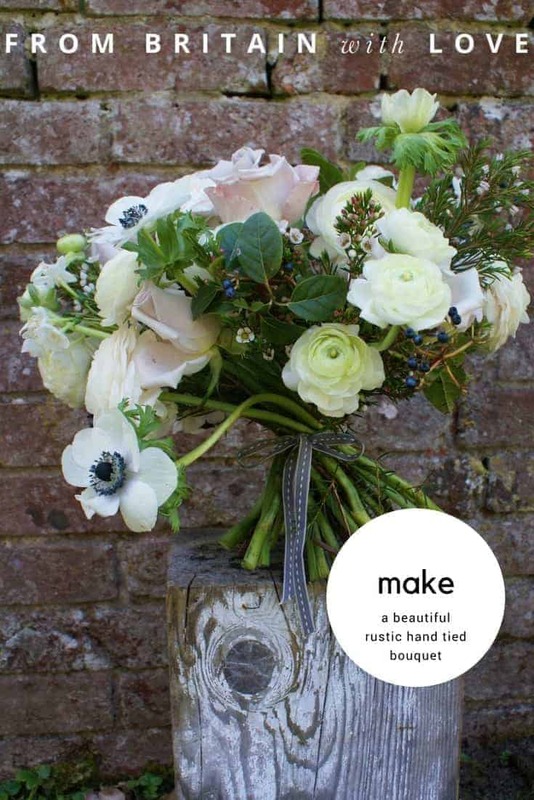 Sarah’s tip here is to hold the bouquet alongside the size of vase you’d like to put the flowers into and use that to guide the length. 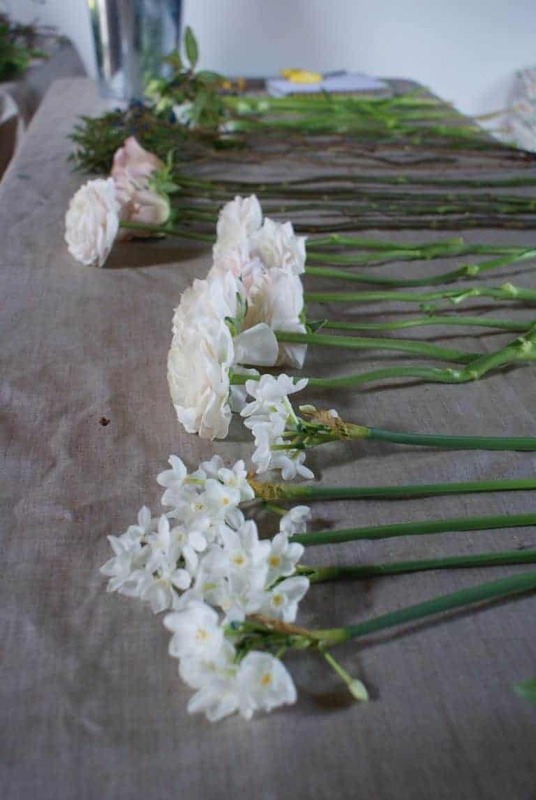 Then you hold the stems ends closely together before cutting in a straight line. 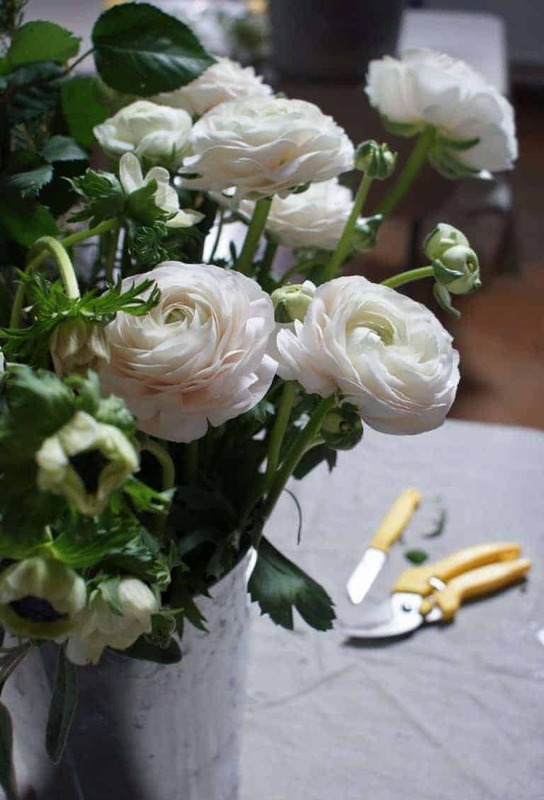 If you cut the stems as they’re fanning out, you’ll struggle to get the level straight. 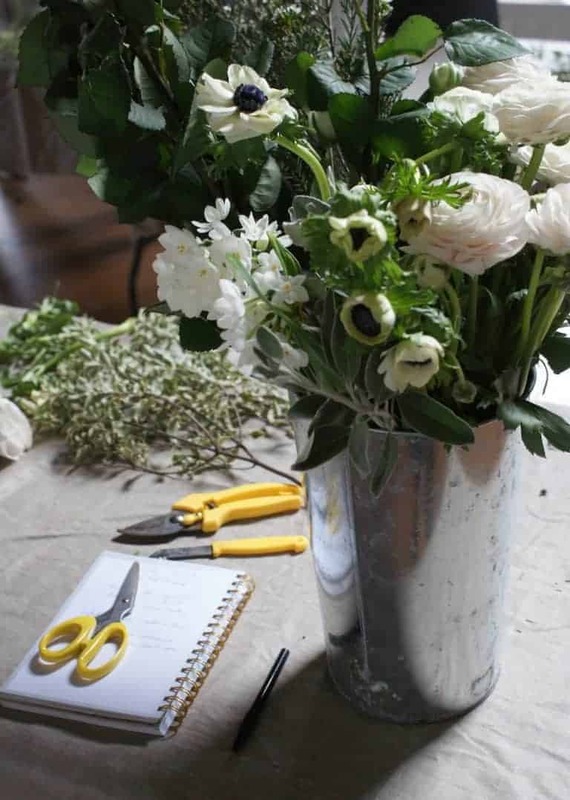 Once cut, you should be able to stand your hand-tied bouquet up by itself. Sarah handed round sheets of cellophane and showed us how to wrap them around our bouquets to create a water container to keep them fresh. 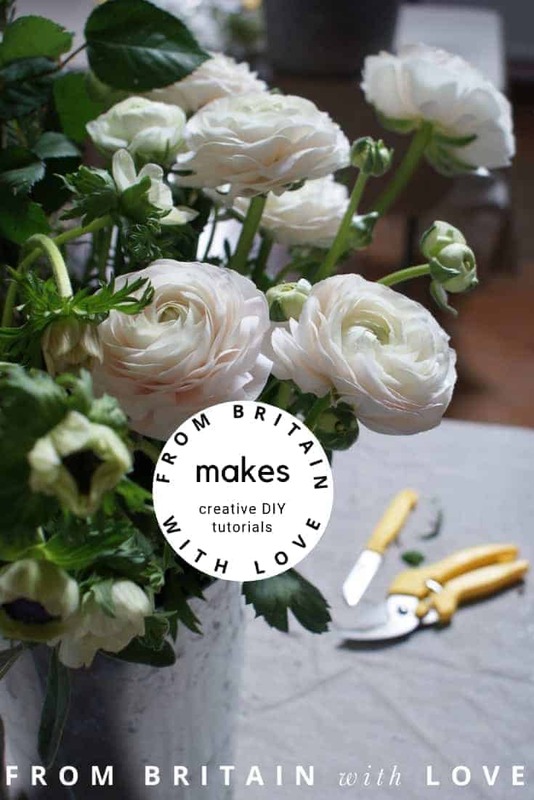 The trick is to position the base of the flowers in the centre of the sheet before you start. Then gradually gather and pleat around as you go, ensuring that none of the edges are below where you’ll be tying. 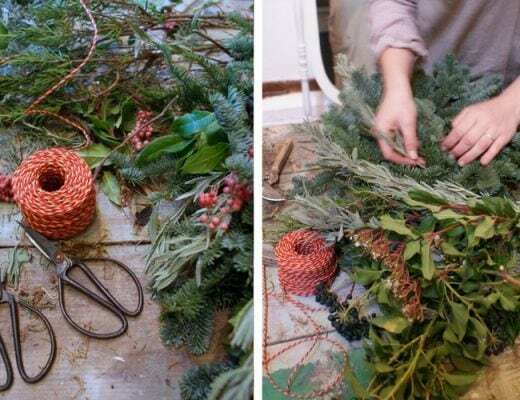 Tie securely with string and then add water gently until there’s sufficient to cover the ends of all the stems. Stylish grey cellophane was the next layer, added the same was as before. 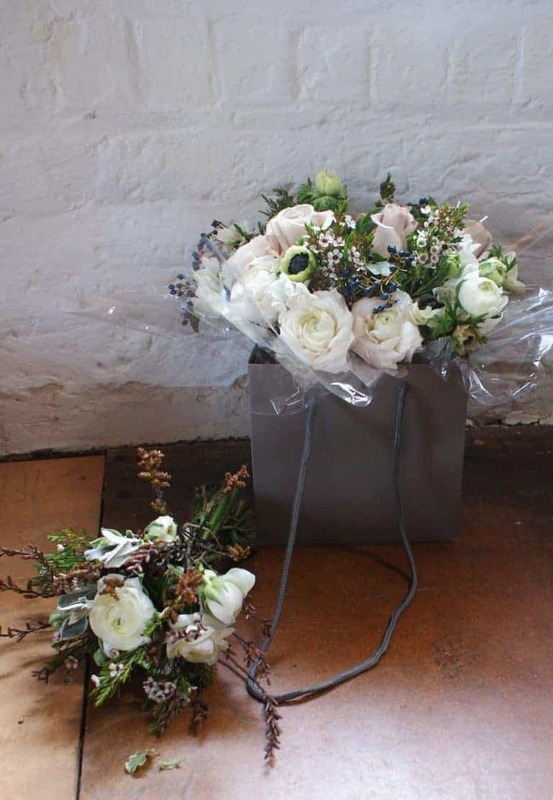 The finishing touch was a simple grey flower bag. Just beautiful. 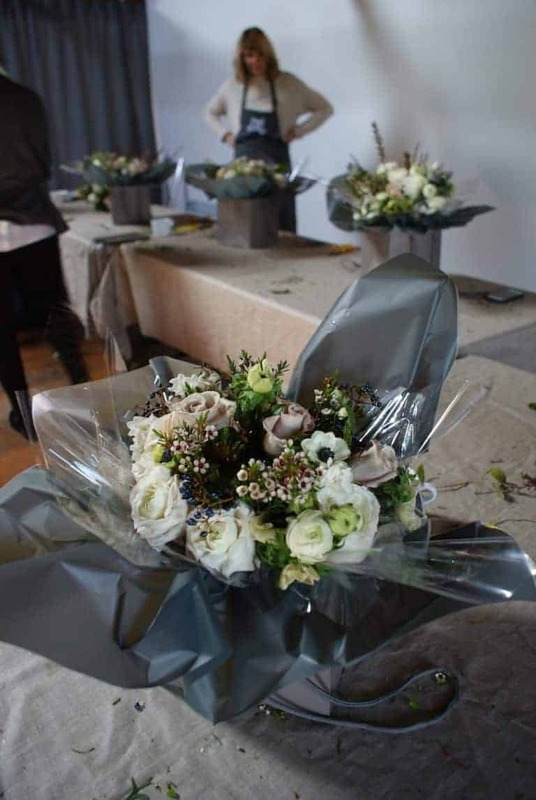 Next we had some fun making little posies, using our offcuts and remaining foliage and flowers. Aprons off, leftover leaves and stem offcuts gathered up into the bag for composting and time to go home. All with armfuls of utterly beautiful flowers. 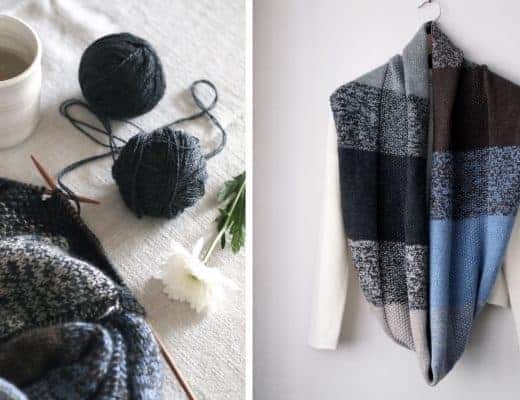 What I loved is that despite starting with exactly the same raw materials to choose from, we all created something totally different. 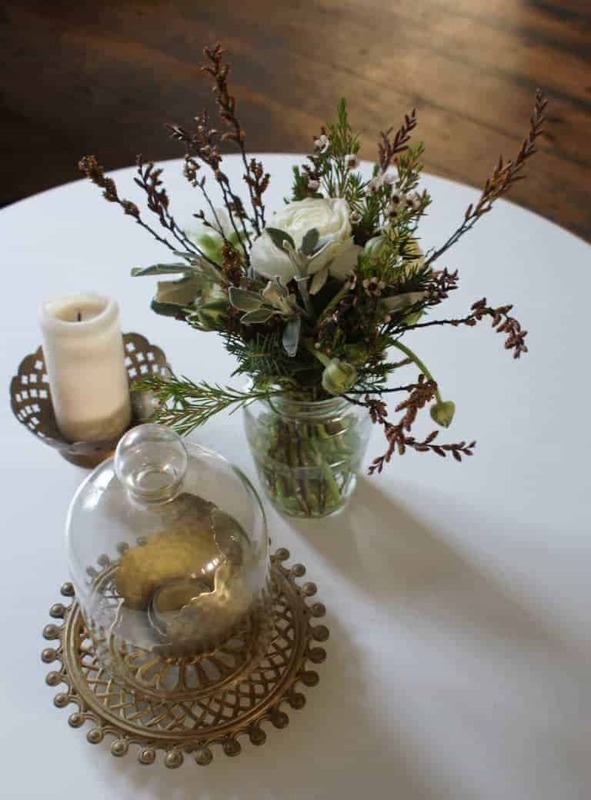 The perfect size for placing in a jam jar, my little posy is now sitting on the coffee table in my living room. I like the way the bronze coloured twigs look with the brass bits and bobs I have on there. 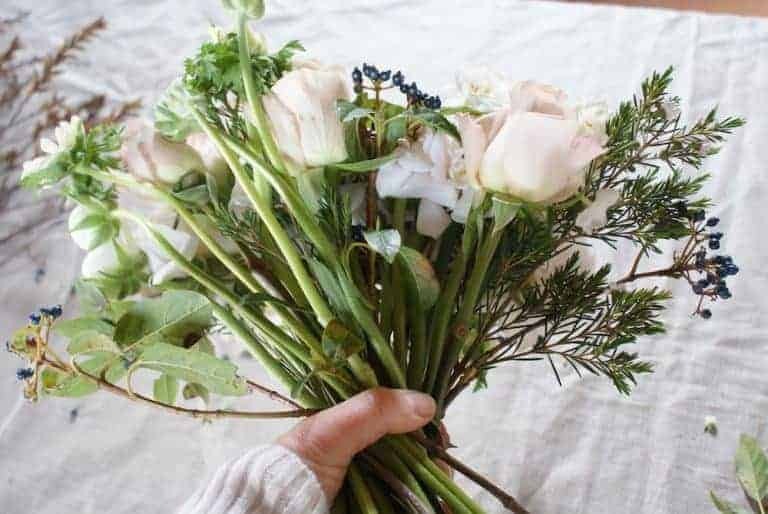 I am so pleased to have learned how to make a hand-tied bouquet. 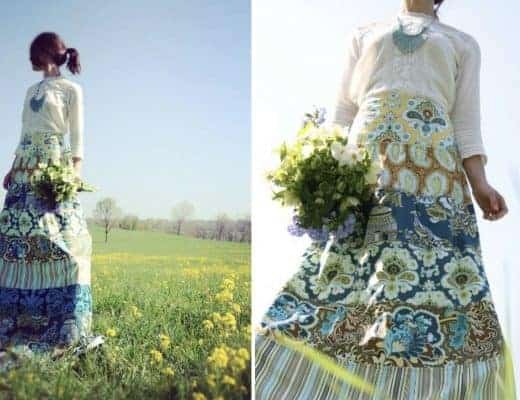 It’s a technique you can use and adapt to any flowers or foliage. When I got home I had some fun taking some more photos. Can’t decide which I like best. What do you think? 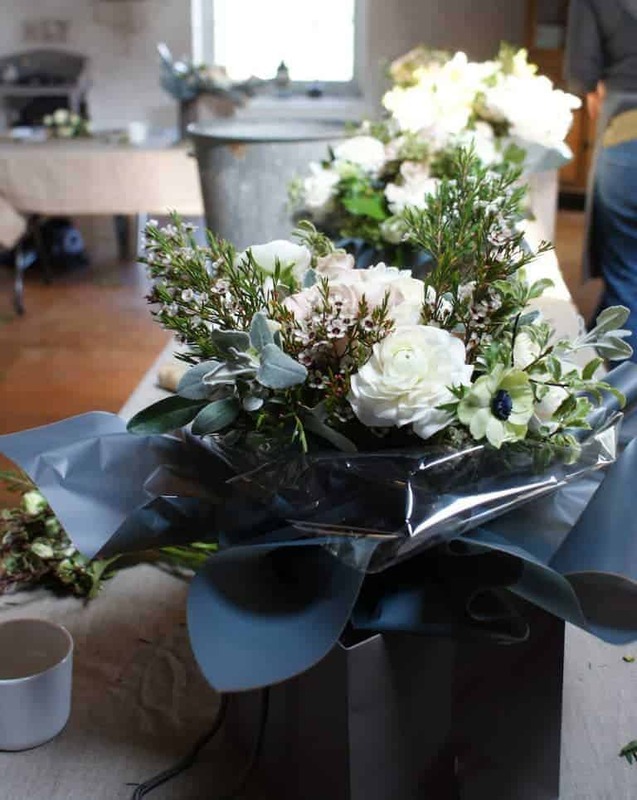 As well as workshops, Sarah also offers a Friday Flowers service. 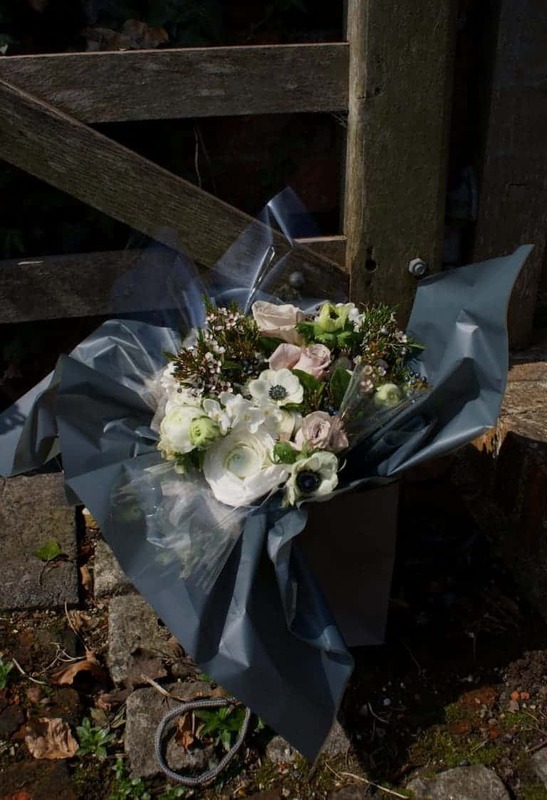 The idea is that you order a seasonal box of flowers beautifully put together by Sarah and sent out each Friday by courier. 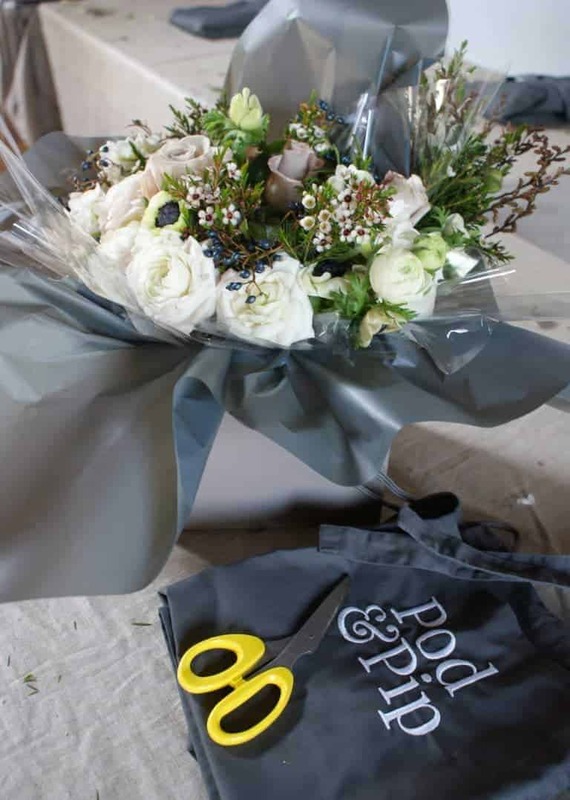 They arrive beautifully wrapped inside a branded Pod & Pid flower box. 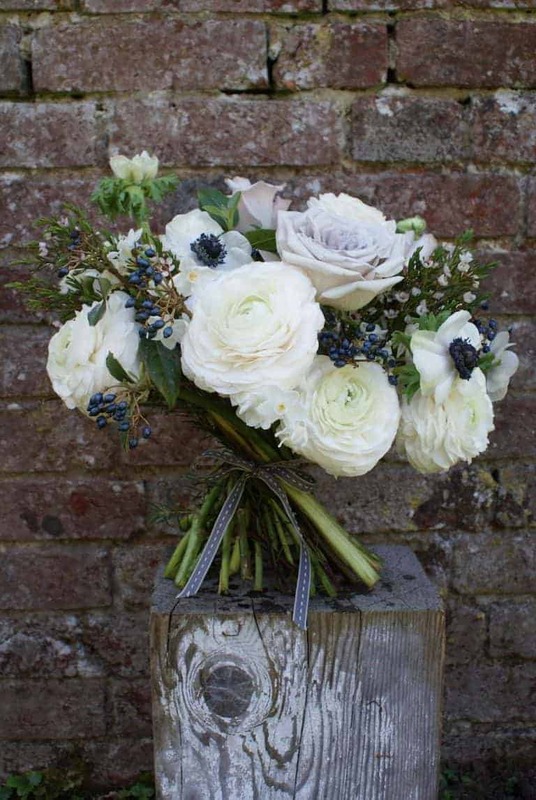 A lovely way to send a gift or simply treat yourself to beautiful flowers for the weekend.